1. Panzer Grenadier Division (DDR) is attacking our BDE. We have identified armor formations with T72 and T55 tanks along with a variety of mixed BMP and BTR. These units is consistent with a reinforced PzG Division. Enemy units is heavily supported by the division and will have mine clearence and bridging capability. Our Panzer BTN (Mixed) task is flanksecurity and delay if needed, along Route Yellow, against what has been identified as an ENY Panzer Grenadier Regiment(mixed) with Armor support from their Division. If they can push us towards River Weber then BDE Southern flank will be at risk. Our BTN is split into 2 BG (Tiger and Lion) with our BG delaying along route Yellow and our sister BG along route purple to our South East. Rest of BTN will be held as reserve and supply units will be ready to support against ENY main effort. We have been given additional support from BDE that will aide us along the route until we have reached Oldsdorff. – 1x PLT of HVY Recon along with 1 Section of Luchs has been assigned to each BG. – Logistic/Aid support from BDE. These are called AidSt.1-3 and will be able to repair or replace any damage within 5 minutes in the zone. 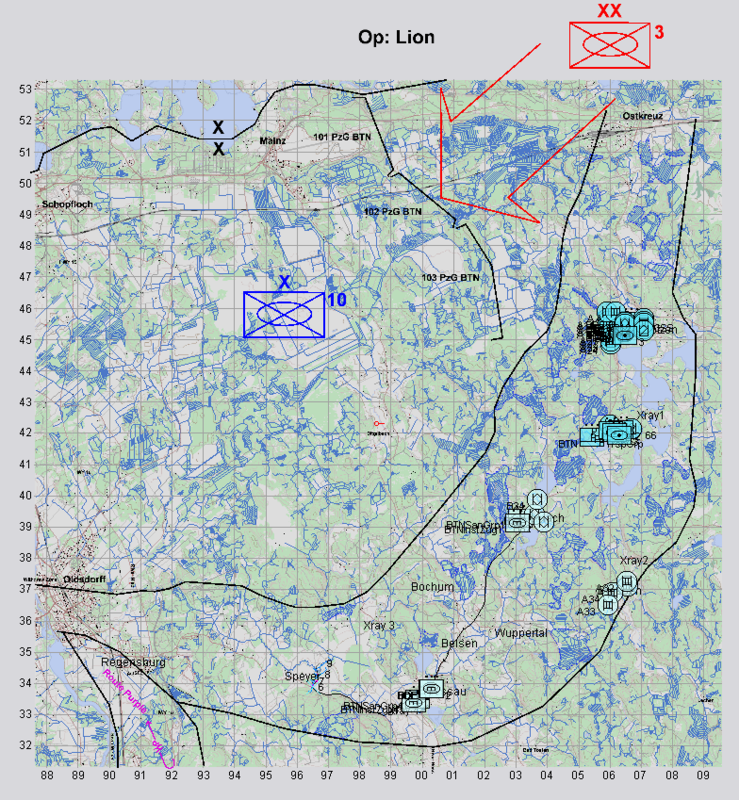 BG Tiger is to provide flank security along route Yellow and Delay ENY forces advancing along the DOA Yellow. Preserve your combat strenght and DO NOT allow yourself to be tied down in battle. BPT cross to West side of Weber should ENY brake through BDE. Also BPT fall back should our flank be threatened by ENY forces. BDE recon will operate between BTN boundries an provide warning should this happen. a. Purpose. The purpose of this operation is to provide a secure south flank for the BDE to fight a delaying battle towards West, so that follow on Divisional forces can launch a counter attack in favourable terrain. ii. Friendly: BDE flanks has been secured. ii. Enemy: ENY units have been delayed / damaged sufficiently for a safe with drawl across Weber or a counter-attack by follow on forces. Civilian: Minimal collateral damage and disruption to the civilian way of life.